O&ST interurban car stopped at the general store. The interurban station is right next door. The crewman is standing in front of the car number, it is possibly No. 102. Photo from Alex Campbell Collection. 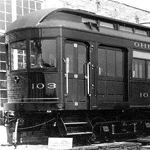 The O&ST was a private interurban line that ran from Hosack Street in South Columbus to St. Joseph's Cemetery just past Shadeville, a distance of 6.8 miles. The railroad was incorporated October 1, 1906, built in 1907 and abandoned in 1929. There was a short section of track in the middle of S. High Street at the north end of the line, then it ran along the west side of the Portsmouth-Columbus Road, later to become U.S. Route 23. Around the halfway point the track switched to the east side of U.S. 23 and continued to St. Joseph's Cemetery. The line was built by Dr. Samuel B. Hartman to serve his Hartman Stock Farm that stretched south of Columbus for approximately four miles along US 23. The Scioto river was the western boundary and Parsons Avenue generally the eastern boundary of the farm which was started in 1903 with 2400 acres and grew to about 5000 acres. The farm had barns and homes all along US 23, which ran through the middle of the farm. There was one cluster of buildings that included grain elevators, a small interurban station, a three track car barn and other buildings constituting the commercial center of the farm. It shows up prominently in many early photos. That cluster of buildings was located south of what is now Rathmell Road. According to a 1911 railroad schedule, hourly service was provided by the line's three passenger cars. 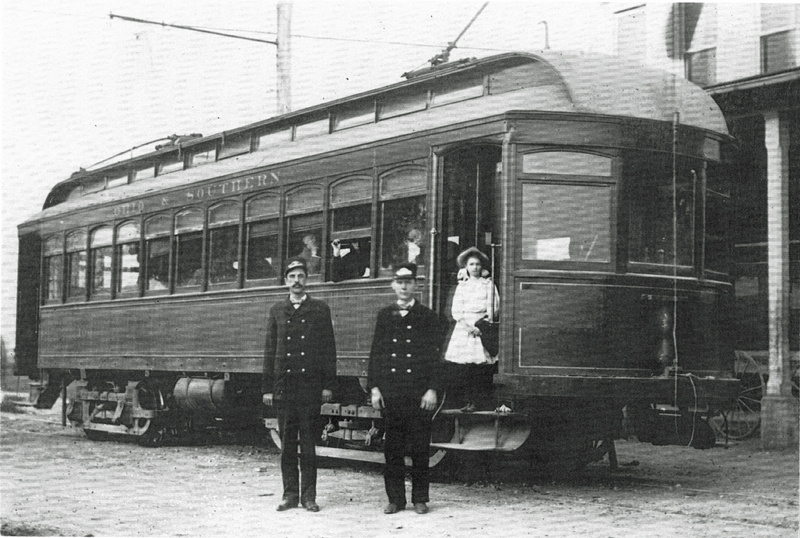 Even though this was a very short interurban line it had big state of the art interurban cars. One person, who grew up on the Hartman farm and was interviewed in 1990, remembered that the cars were red. She rode the cars to church in Columbus every Sunday. She and her family would change to a city streetcar at the Columbus border and continue on to their church. The O&ST had a steeple cab electric locomotive and other freight and service cars. There was a freight interchange with the Hocking Valley Railway. A spur at the north end of the line ran down the center of Kingston Avenue leading from the O&ST to the Hocking Valley Railway. The interchange allowed farm products and livestock to be shipped from the farm as well as supplies to be received. The Hartman farm raised a variety of crops and livestock. There was a cannery and a dairy located on the farm. In the early days their specialty was registered horses although they had a large registered dairy cow heard as well as other live stock and poultry. With an Armour slaughter house at the Columbus border, the farm may have raised cattle for meat as well. It was reputed by Dr. Hartman to be the largest farm in the United States in the early Twentieth Century. The interurban line met the Columbus Railway Power and Light Company's South High Street streetcar line. The O&ST was built to standard gauge and the South High Street line was wide gauge. The CRP&L and OS&T shared dual gauge track from the center of the South High Street viaduct over the Hocking Valley and Toledo & Ohio Central tracks to Hosack Street, a distance of about two city blocks. Passenger service was provided for the employees and visitors. Dr. Hartman's many businesses were built on profits from his Peruna brand patent medicine. Visitors were coming to the farm to enjoy an outing and to purchase his medicine. There were two small hotels where visitors could stay overnight. The distinctive feature of the farm was the miles of white fences and farm buildings. Even in the 1950's and 60's it looked very prosperous with its large orchards and farm fields. In the Twenty-first Century the farm with its white fences and many buildings has been replaced with an interstate highway interchange, race track and quarry. There is no evidence of Dr. Hartman’s private interurban line having ever been there.